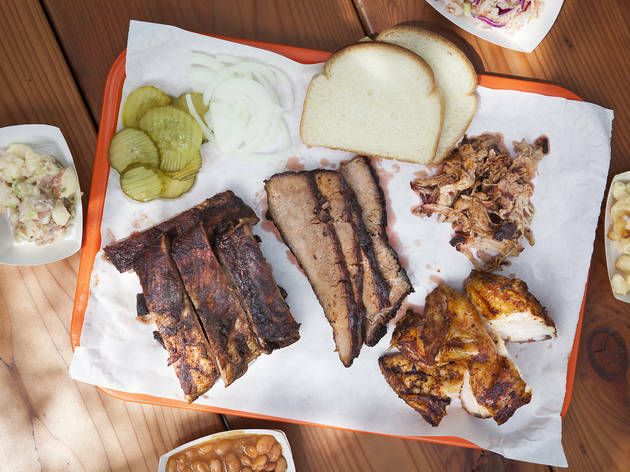 Few native food traditions are as robust as America’s obsession with barbecue: highly seasoned, long-smoked meats that arrive on the plate tender, juicy and irresistible. 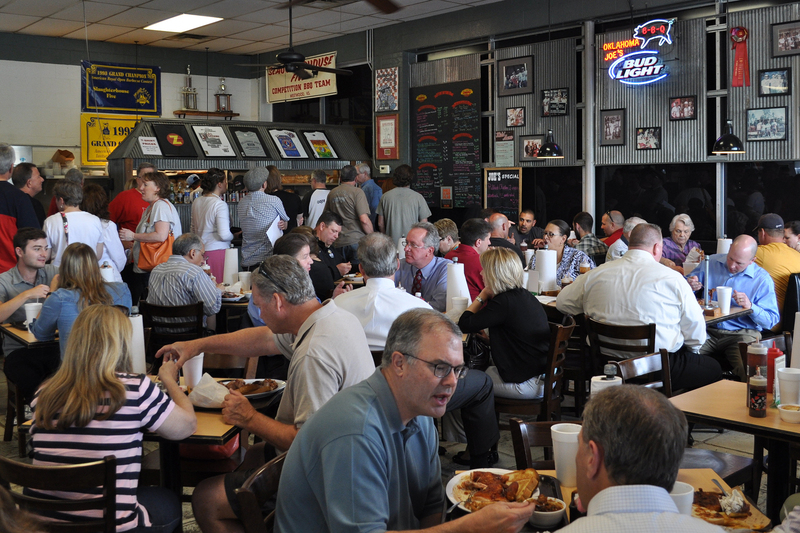 BBQ has its roots in the South, but luckily for meat lovers everywhere, authentic smokehouses have proliferated across the nation. While it’s possible to find barbecue-style dishes at the best diners in America, the best steakhouses in America and even at the best brunch restaurants in America, when the craving strikes we go straight to the source. 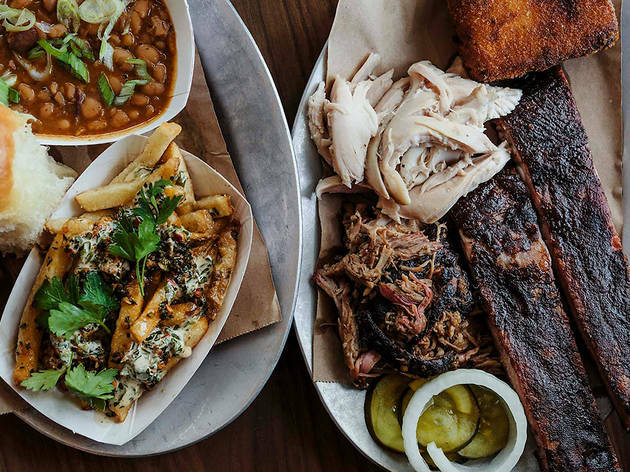 From roadside shacks to sprawling eateries serving saucy smoked ribs, brisket and pulled pork, here are the best BBQ restaurants in America. 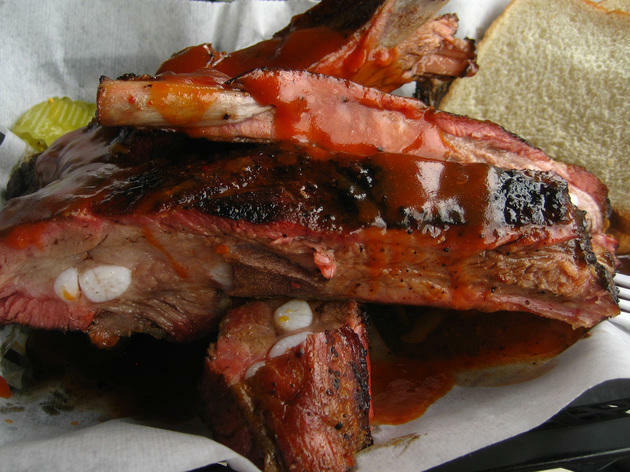 Consistently ranked among the nation’s top BBQ joints, this smokehouse epitomizes the Kansas City style: slow-smoked meats slathered in a thick, sweet, tomato-and-molasses-based sauce. 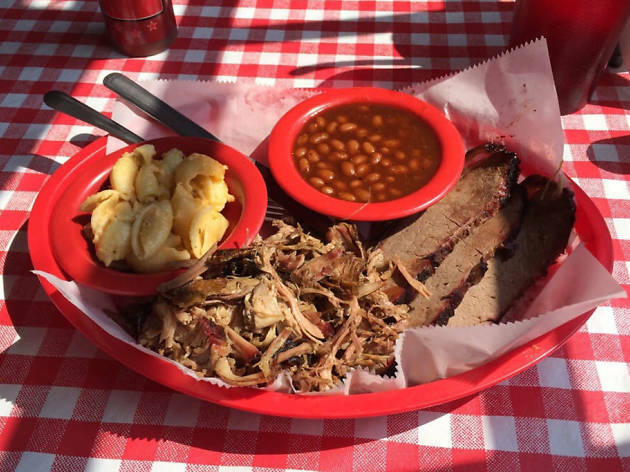 Kansas City—on both its Kansas and Missouri sides—is chockablock with excellent BBQ spots, but Joe’s is a (two-) statewide favorite. 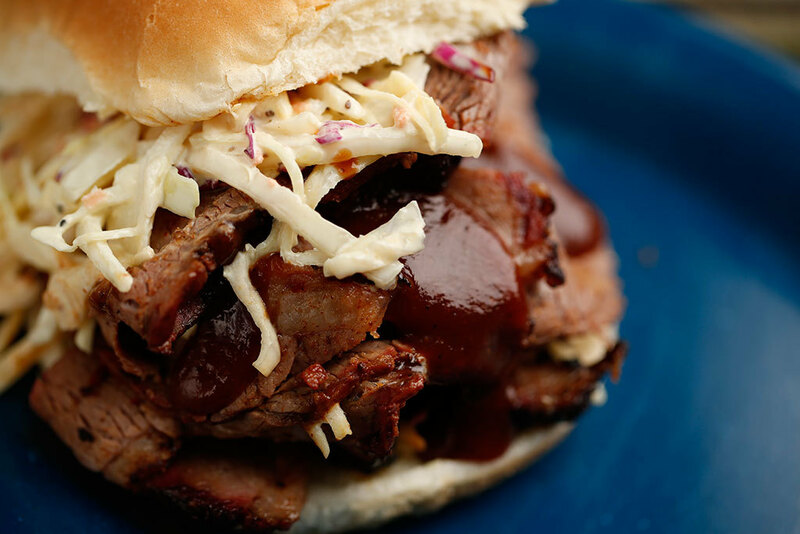 Don’t miss the iconic pulled pork and beef brisket, or, if you can’t decide between the two, go for the Smoky Joe, which combines both on a soft oversized bun. 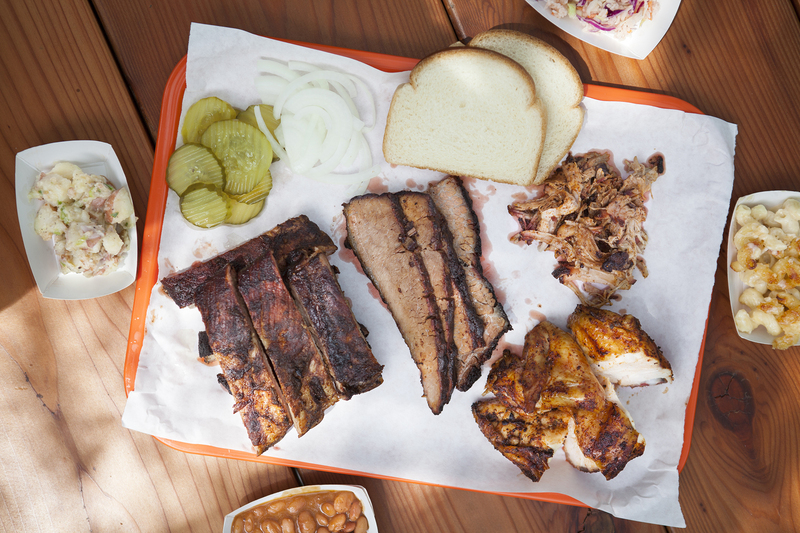 Perhaps the first state that comes to mind when talking about barbecue, Texas is swathed in excellent BBQ joints whose styles vary slightly east, west, central and south. 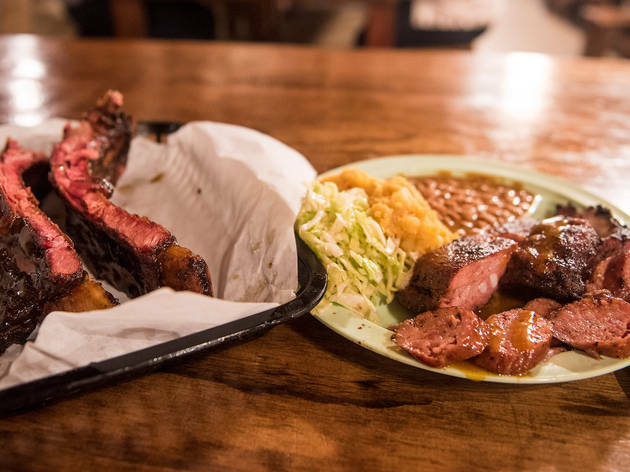 The Salt Lick, a consistent favorite among smokeheads, serves the Central style, spice-rubbed meats slow-cooked under indirect heat from pecan and oak wood. 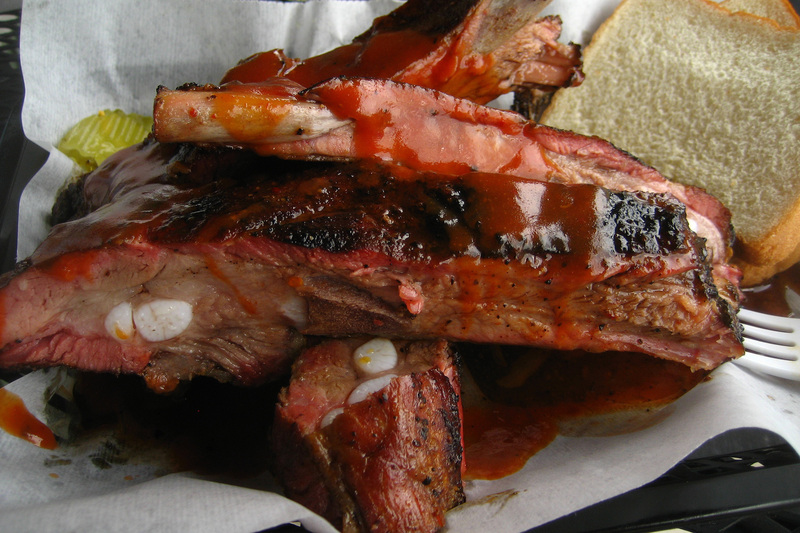 Our favorite option is the moist, juicy beef brisket, but you can’t go wrong with the pork ribs, sausage or surprisingly tender turkey, either. Plus, it’s BYOB—need we say more? 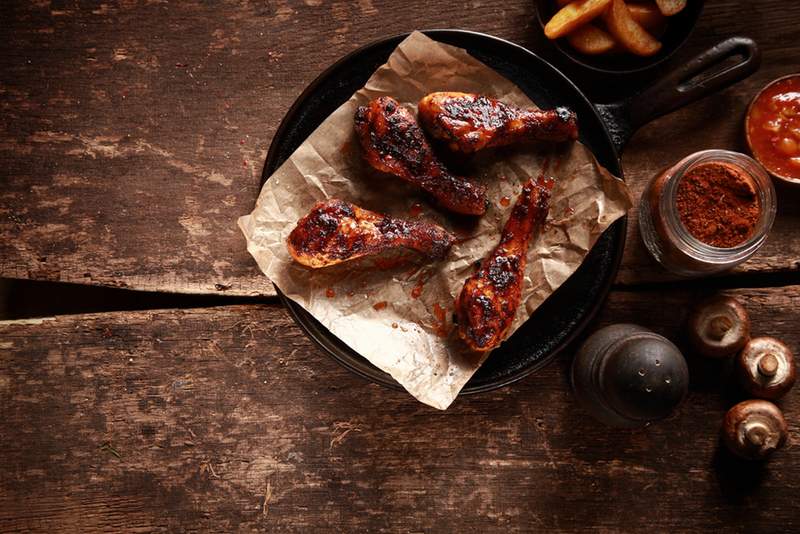 Another important capital in the nationwide BBQ scene, St. Louis cooks up a sauce-heavy style of barbecue glossed with a light, tangy, tomato-based sauce. 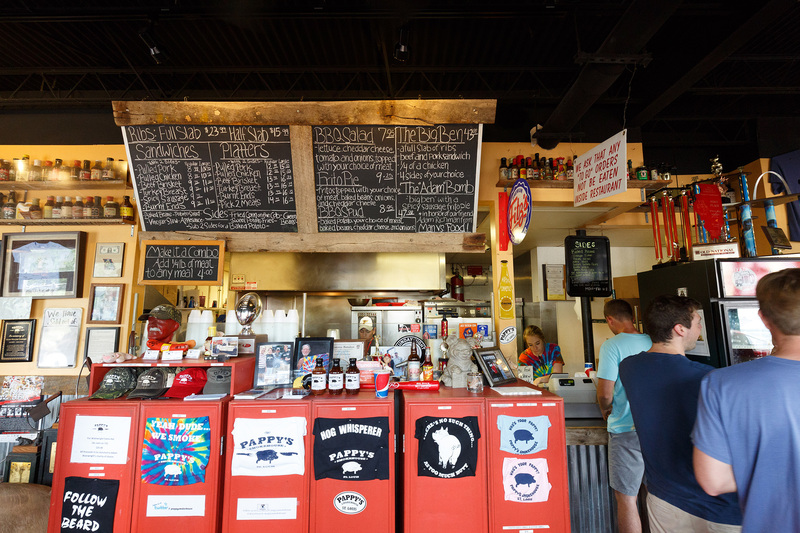 In a city full of excellent smokehouses, Pappy’s is a local legend, garnering fans with its genre-defining pork ribs: dry-rubbed then slow-smoked over apple and cherrywood until crispy without and melting within. 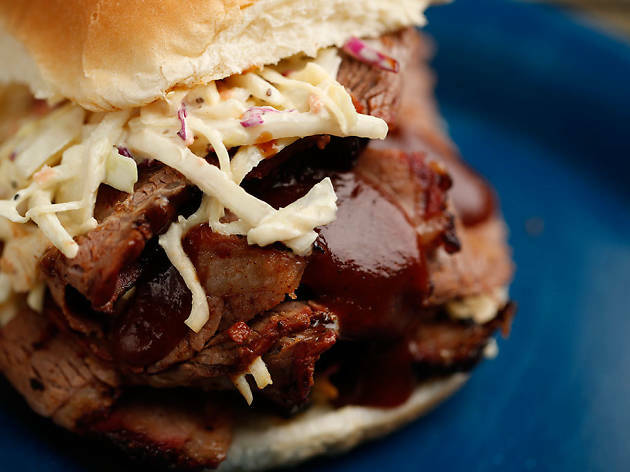 Honorable mention goes to the burnt ends, the rich, tender points of a beef brisket. 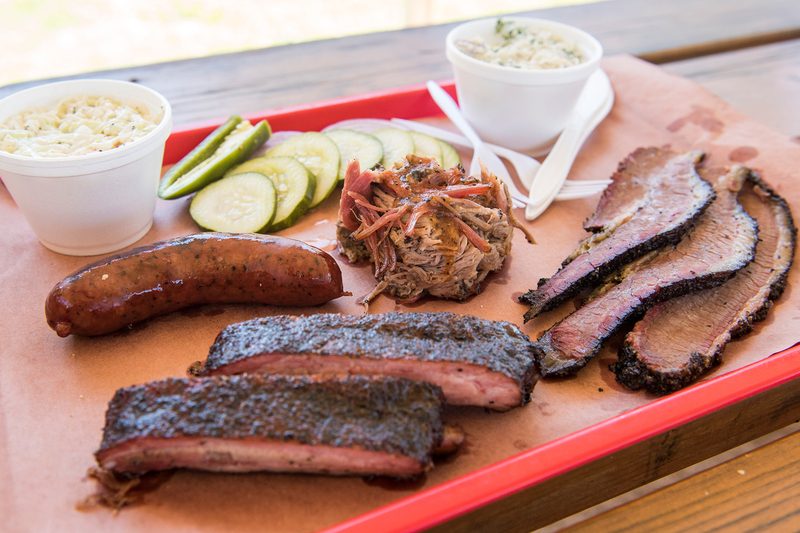 Come for the essential brisket, pork ribs and sausage, but stay for the sides (and occasionally, the free beer). At this East Side trailer, surrounded by a few simple picnic tables with some enormous old trees for shade, it’s the chipotle coleslaw—zestier than most with a kick to match the house-made chipotle sausage—and fresh black bean salad that raise the total-package bar a cut above. 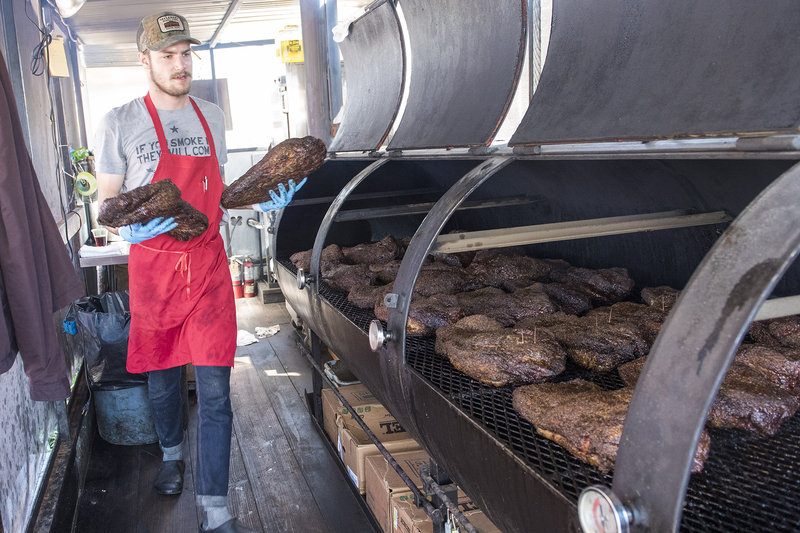 Perhaps it’s also the humble, genuinely friendly nature of young pitmaster Dylan Taylor that gives La Barbecue’s meats the highest-quality edge. Or it could be that dash of granulated garlic they add to the traditional salt and pepper rub. 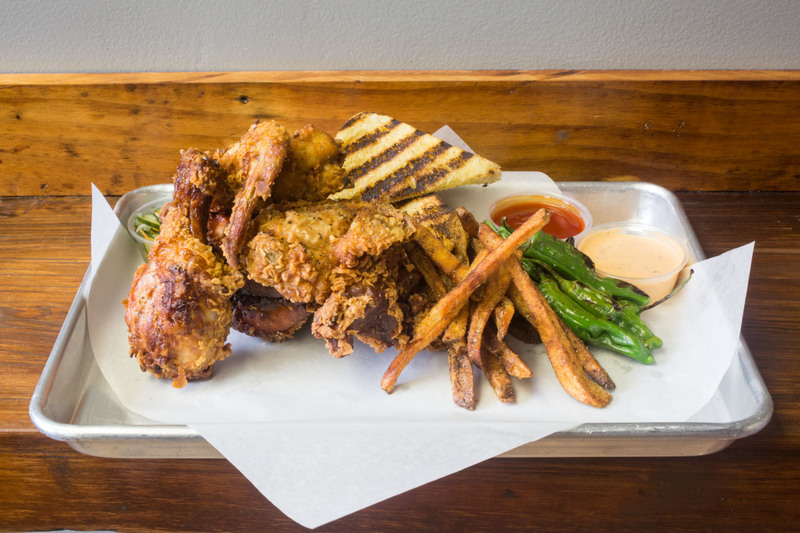 In any case, there clearly isn’t a lack of reasons why no one in ATX cooks it up better. Just make sure to arrive early—when the meat sells out, they close for the day. 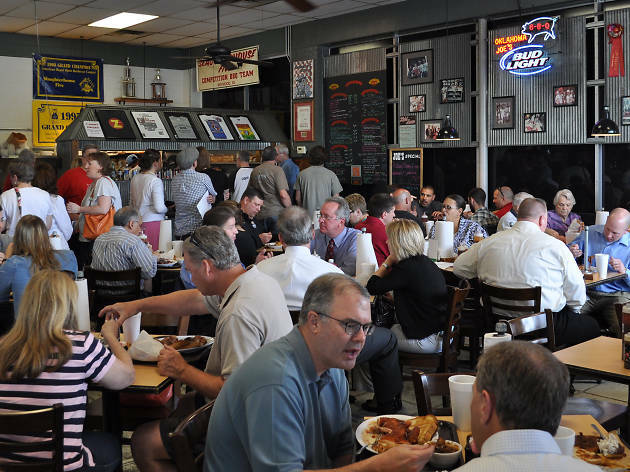 Heavy on pork, with ribs and shoulder taking center stage, Memphis-style BBQ is one of the country’s four predominant types. 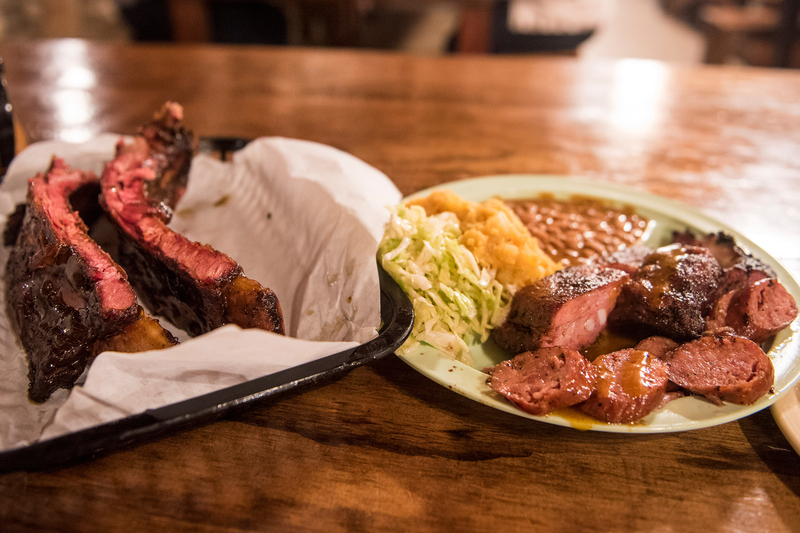 There’s nowhere better to sample it than at ground zero, downtown’s Central BBQ. Consistently ranked among the city’s best smokehouses, Central’s 24-hour-marinated ribs are rightfully revered: dry-rubbed, smoky and oh-so-tender, they all but fall apart in your hands. Want more pork? 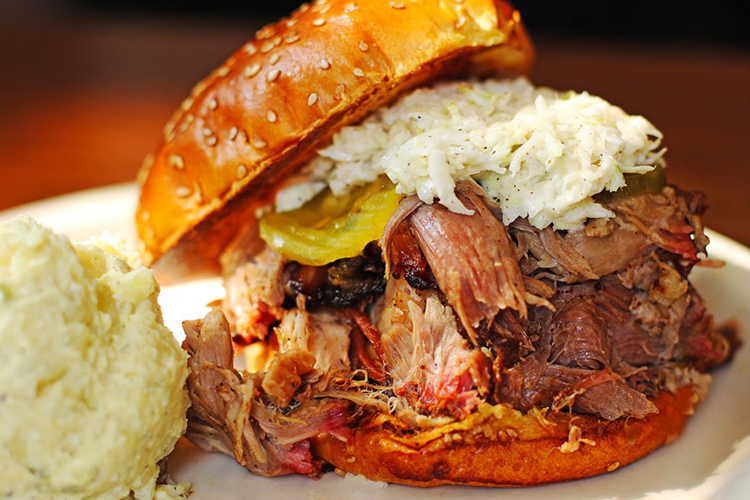 Go for a pile of Central’s soft, juicy pulled pork, anointed with mild, hot or vinegar-based sauce. 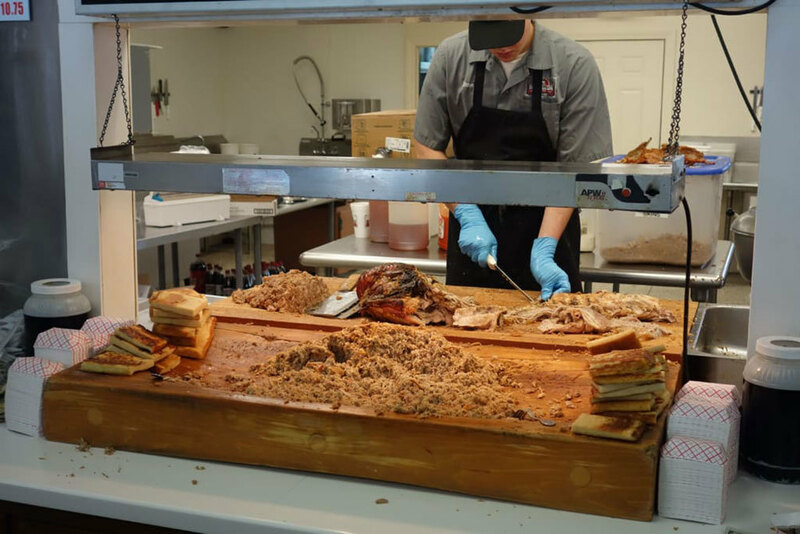 Throughout the state of Alabama, cuts of pork are barbecued over hickory, oak and pecan wood until smoky, tender and infused with spice. Pulled pork typically defines the genre but gets a unique spin from a local condiment: white sauce, a tangy whip of mayo, cider vinegar and lemon juice that adds acidity and richness to the soft meat. At Saw’s, a Birmingham institution since 2009, this meat-sauce combo is perfection on a bun. Don’t sleep on the stuffed potatoes, loaded with hearty fillings such as bacon, green onions and cheddar. 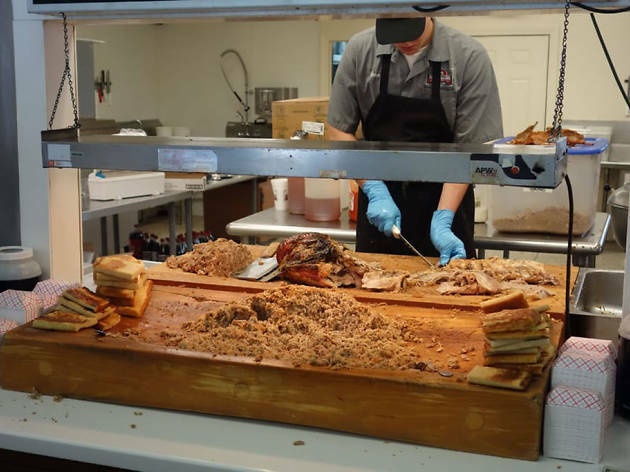 In Eastern Carolina, barbecue means one thing: whole hog. 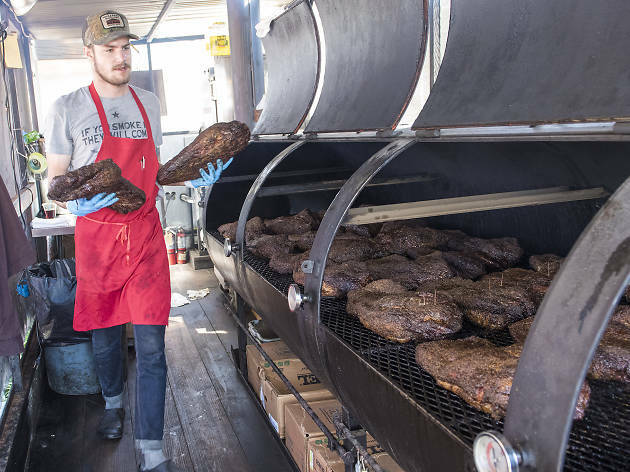 In this part of the state, pitmasters have perfected the ancient and delicate art of smoking a whole animal over indirect oakwood heat for hours and hours—often overnight—until all the cuts yield a smoky, falling-apart mess o’ meat. 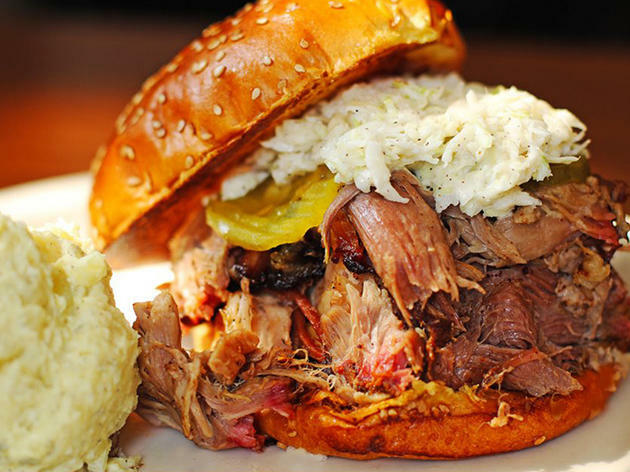 Skylight Inn, owned and operated by the Jones family since 1947, is a pillar of the form: recognized by everyone from the James Beard Foundation to Southern Living to the Travel Channel, the smokehouse keeps things simple, serving top-notch plates and platters of whole hog BBQ with slaw and bread and not much else. 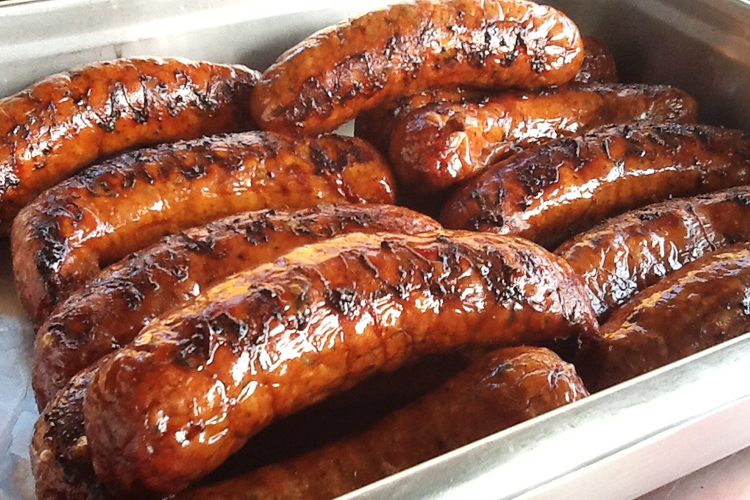 And once you dip your fork into a pile of their expertly barbecued pork, you won’t want for much else, anyway. 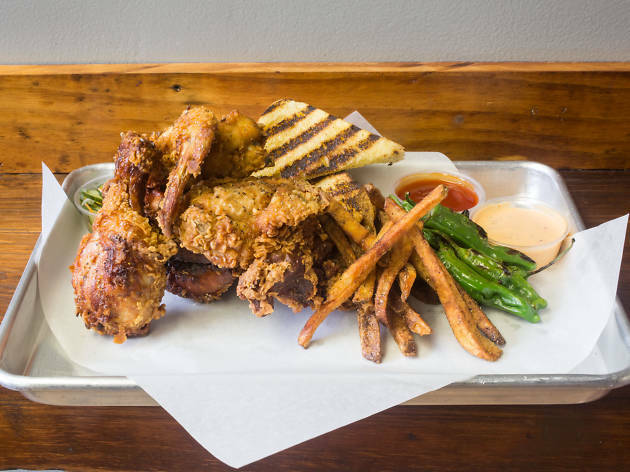 Twin Texpats Justin and Jonathan Fox helm this Austin-by-way-of-Atlanta restaurant near downtown’s Little Five Points. 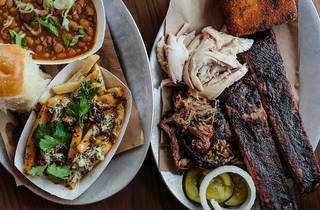 The freewheeling menu at Fox Bros. culls from the entire American barbecue diaspora. Think chicken-fried pork ribs, Tater-Tots covered in brisket chili or Brunswick stew and pulled-pork sandwiches accompanied by crispy fried okra. 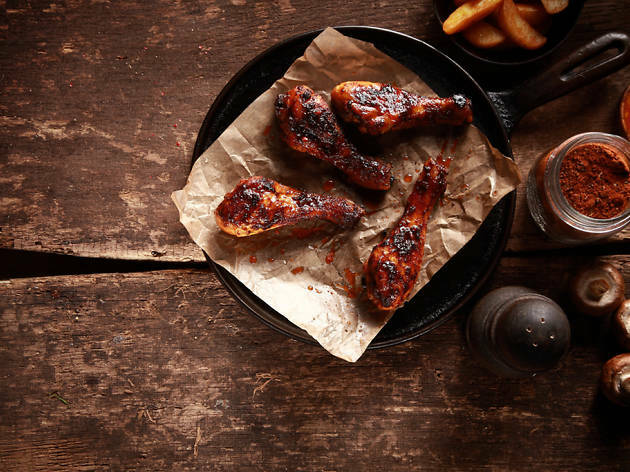 Smoked chicken wings are a crowd-pleaser, as are the in-demand, until-sold-out dinosaur-like beef ribs. Seven rotating drafts and 45 bottled beers include local names SweetWater and Terrapin. 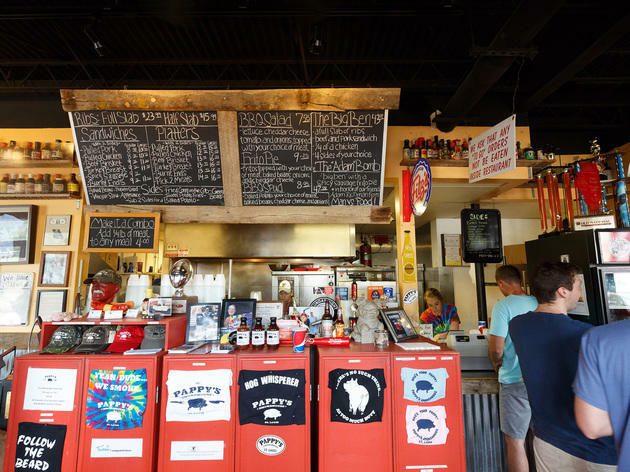 Little Lexington, Kentucky, a town of only about 300,00 souls, is nevertheless crowded with excellent BBQ spots: this is a place that takes smoked meat seriously. 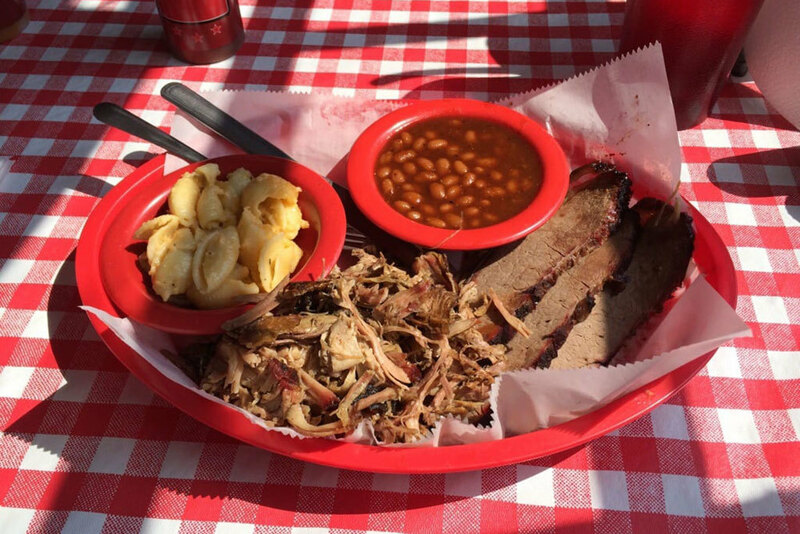 Locals divide their loyalty among about a dozen top spots, but we head to Red State BBQ, a little roadside joint serving up big, flavorful barbecue. 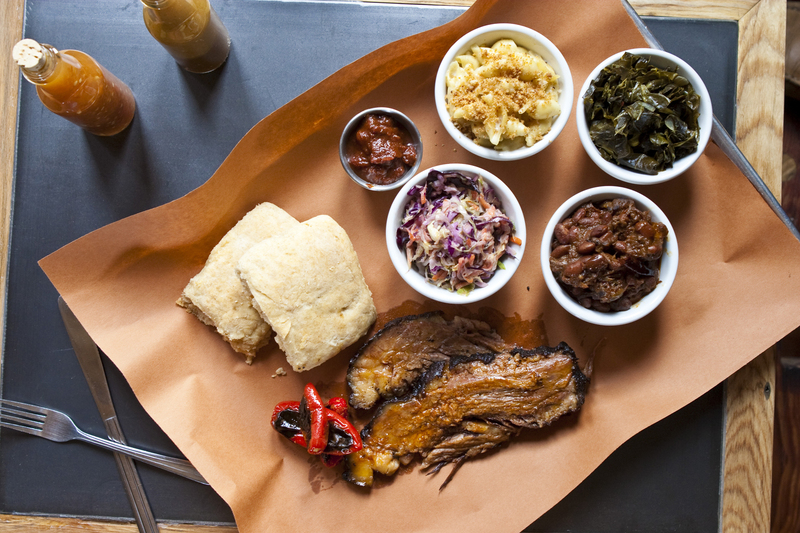 Pulled pork, beef brisket and pork ribs are dry-rubbed and smoked low and slow, then anointed with Red State’s excellent house-made sauces: Texas Spicy, North Carolina Spicy Vinegar, Memphis Sweet and South Carolina Mustard. For dessert, don’t miss the homemade peach bread pudding topped with a scoop of bourbon ice cream. 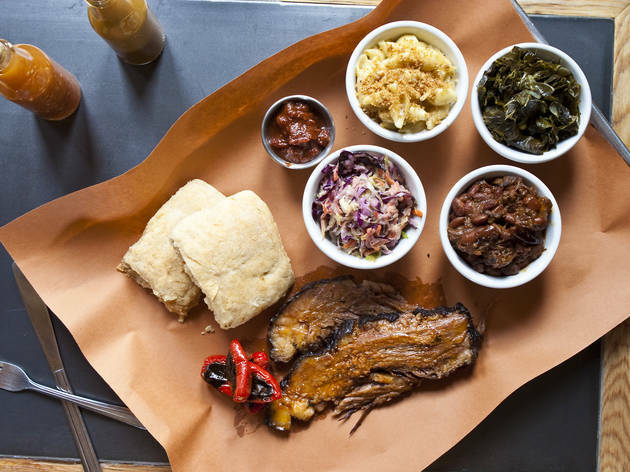 NOLA’s homegrown food scene hardly disappoints, but, until recently, American barbecue was notably absent among the po’boys and pralines. 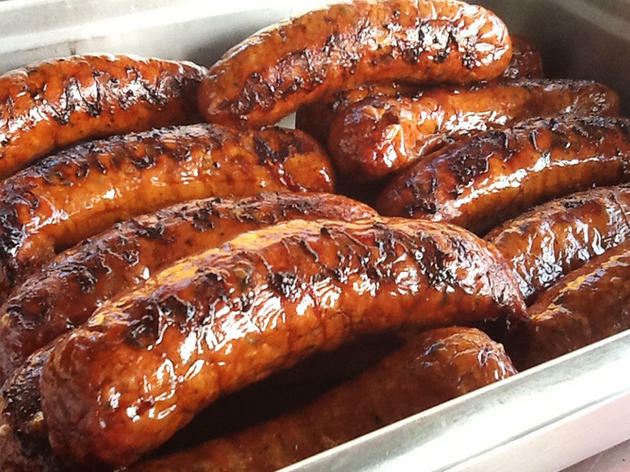 Since 2004, Bywater fixture The Joint has been raising the regional bar(becue) for pork ribs, shoulder, brisket and chaurice sausages. 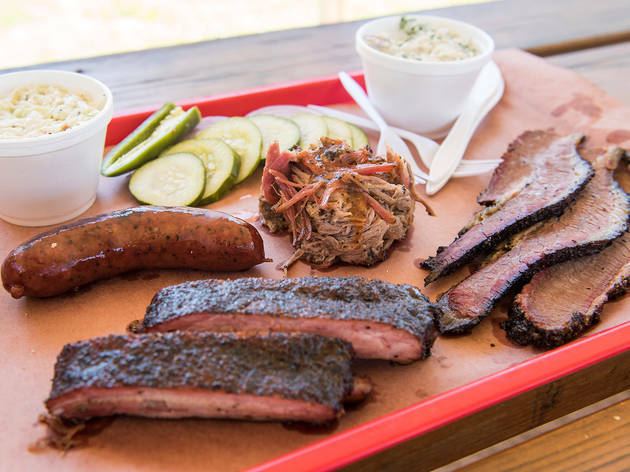 Meats are smoked on-site in a custom smoker, and portions are epic, but in-the-know locals end their ’cue with slices of the Joint’s legendary pecan, key lime and peanut-butter pies.